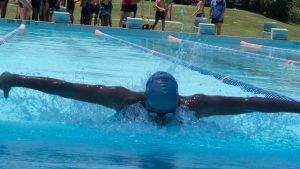 It was hot in the pool and out of it at the 2017 Secondary Swimming Carnival. Set amongst the greenery of Bellbowrie Pool, students contended with 36 degree heat as they cheered, swam and broke long-standing records. Zoe Pekerti of Year Nine (pictured, below, right) stunned the crowd, smashing four records, some more than a decade old, on her way to achieving Age Champion. Sports Co-ordinator, Lynda Williams announced “she is one of the most electrifying swimmers we’ve had here at Westside. Zoe could well be the next Alania Suttie.” In 2016, College graduate Alania Suttie represented Samoa at the Oceania Swimming Championships. She also swam for Samoa at the Youth Commonwealth Games. Zoe mid-stroke on her way to smashing four College records. After an upset inter-house victory in 2016, Cuthbert looked to tighten its grasp over the Edwards Shield. But it was not to be. With Kai Williams looking strong as the 12 Year Boys Age Champion, Gould came devastatingly close to nabbing the coveted prize. Led by House Captains Katelyn Sedwell and William Castano, Nicholls secured a record sixth straight victory. It is worth noting Castano achieved Open Boys Age Champion, blitzing the competition on only one good leg. Head of Secondary, Joshua Mansfield reflected “Some of our best swimmers have clearly been training hard and preparing well for this carnival and it was fantastic to see their results.” The day ended to the echoes of Nicholl’s Who Are We warcry. Competition and camaraderie are alive and well at Westside. During the traditional all-in-swim, students paddled boats, inflatable thongs and giant swans down the length of the pool. Students beat the heat swimming more than 1000 combined laps. Westside Christian College congratulates Mrs Lynda Williams on running an exceptional swimming carnival. Westside also congratulates the participants, parents and spectators on their efforts.